Like its predecessor, the mid-sized Brokk 300 is just 47.2 in. (120 cm) wide, but can handle larger attachments weighing as much as 1,102 lbs. (500 kg). The Brokk 300,which features 40 percent more demolition power than its predecessor, the Brokk 280, also boasts SmartConcept technological features that improve power management, reliability, maintainability and ergonomics. 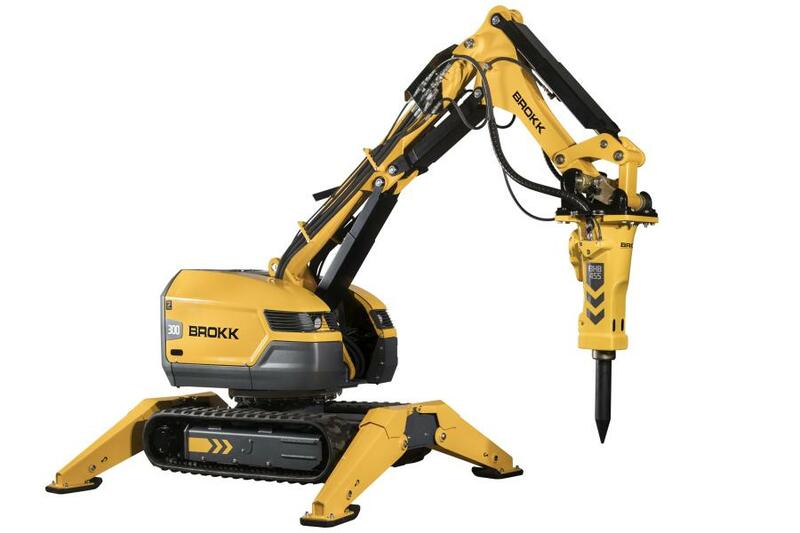 The Brokk 300 is one of four new next generationBrokk remote-controlled demolition machines Brokk showcased at World of Concrete 2019. "This new machine features a truly impressive power-to-weight ratio and the industry-leading smart technology," said Martin Krupicka, Brokk Group CEO. "The design shows our engineers' responsiveness to operators' ever-increasing demands for using bigger, more powerful breakers without sacrificing safety or maneuverability or taking up more space on the job site." With Brokk's new SmartConceptsystem, operators also experience improved performance and uptime. SmartConcept consists of three features: SmartPower, SmartDesign and SmartRemote. The intelligent electrical system, SmartPower, protects the machine from the damage that can be caused by poor power supplies while optimizing power and hydraulic performance in extreme temperatures. SmartDesign extends machine life and provides ease of maintenance due to 70 percent fewer cables as well as hardened components, LED headlights and easily accessible grease points and hydraulic hoses. An ergonomic remote-control box, the SmartRemote, incorporates adjustable straps, intuitive controls and professional-grade radio technology with a 984-ft. (300-m) working range. As with all Brokk machines, the Brokk 300 offers exceptional reach and movement. The three-part arm extends to 21 ft. (6.5 m) vertically and 20 ft. (6 m) horizontally. The arm also rotates 360 degrees for optimal flexibility. Brokk outfits each Brokk 300 with a BHB 455 hydraulic breaker with 855 joules of hitting power. The machine also pairs seamlessly with beam grapples, clamshell buckets, concrete crushers, demolition and scoop buckets, drills, drum cutters, metal shears, planers, rock splitters, shotcrete nozzles, sorting grapples and rock splitters. For more information, visit www.brokk.com.